Academic Conversations gives you the structures you need to foster quality conversations in language arts, social studies, science, and other subjects. Students will develop critical skills for exploring an important question, idea, or topic. Stenhouse Publishers writes, "Where would we be without conversation? Throughout history, conversations have allowed us to see different perspectives, build ideas, and solve problems. Conversations, particularly those referred to in this book as academic conversations, push students to think and learn in lasting ways". To address these challenges, authors Jeff Zwiers and Marie Crawford have identified five core communication skills to help students hold productive academic conversations across content areas. These skills include: elaborating and clarifying, supporting ideas with evidence, building on and/or challenging ideas, paraphrasing, and synthesizing. 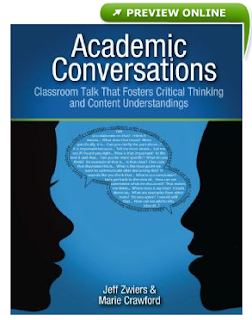 This book shows teachers how to weave the cultivation of academic conversation skills and conversations into current teaching approaches. Marie Crawford is an assistant principal at Central Middle School in the San Carlos School District.